Summit Tooling in McHenry, Ill., has the capabilities to provide all of its part processing—from design to production—under one roof. The company is known for the prototype molds it creates for diverse businesses in the medical, packaging, electronics and automotive markets. In order to stay innovative, Summit Tooling wanted to improve the flexibility of its sinker EDM technology. Its engineers were limited in their part designs due to the performance of existing machines. Summit Tooling also wanted to improve accuracy, quality and consistency in its new mold designs, especially when tolerances of 0.0001 inches were required. By obtaining new equipment, it hoped to increase flexibility, efficiency and profitability as it landed new business opportunities. Additionally, it wanted to stop outsourcing fine-hole operations. Previous experience with two Makino S33 vertical machining centers and an a61 horizontal machining center first introduced Summit Tooling to the type of service that Makino could deliver. 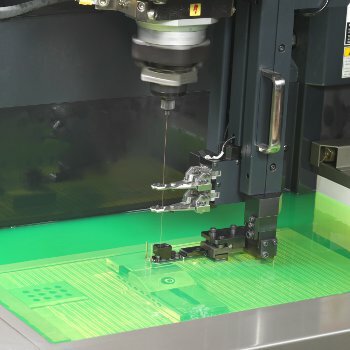 Because of the favorable support it experienced in using the new technology to its fullest potential, Summit Tooling obtained two Makino EDAF2 sinker EDM machines. These machines replaced a set of nine conventional sinker EDM machines, on which the company had reached the limitations of capability. When Summit Tooling brought its fine-hole operations back in-house, it was able to consistently create small holes with diameters ranging between 0.003 inches and 0.01 inches. It used to take anywhere from two to three weeks in lead-times to create the holes through outsourcing. Now with the EDAF2 machines, Summit Tooling can make the entire tool, including fine holes, in less time than it previously took for fine-hole outsourcing alone. The machine’s C-axis configuration has enabled Summit Tooling to build multiple features into a single electrode. This capability not only saved on production time, but overall electrode consumption has also gone down.